The City of Artesia is asking for continued patience from residents as crews work to make their way into residential areas that have been difficult to travel since Sunday. Numerous Artesians contacted the Daily Press Tuesday evening and today to express frustration over plows having not yet visited their streets. Many without four-wheel-drive or larger vehicles report finding themselves unable to navigate the ice- and snow-packed roads or even exit their driveways without becoming stuck. The City Infrastructure Department understands the frustration and says it is continuing to work today on making residential streets passable. Crews are out today in the southeast, south-central and northern areas of town clearing roads, and an outside contractor has been brought in to assist. 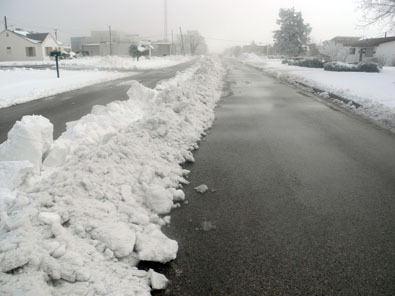 The department reports, however, that plowing cannot occur in areas where cars have been left in the street or are lined too densely along the roadway, particularly if the vehicles are not parked parallel. In these instances, the heavy machinery cannot navigate the roadway without causing damage to vehicles. The department says it is salting roadways the machinery can’t currently reach in hopes of reducing some of the ice layers to slush.